This post was written by Evan Barrientos, one of our Hubbard Fellows. Evan is a talented writer and photographer and I encourage you to check out his personal blog. If you would like to see more of his photographs, you can follow him on Facebook. 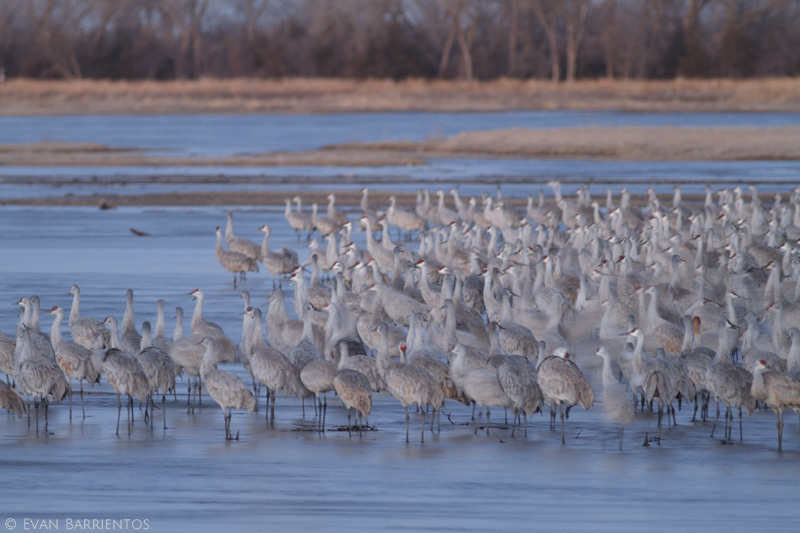 Although crane migration is just beginning, I couldn’t resist trying to photograph the early arrivals from one of our blinds along the Platte River last weekend. At 6am I parked 200 yards south of the blind. A full moon and the encouraging sound of cranes calling guided me through the dark. When I was 50 yards away from the blind I started crawling so the cranes wouldn’t spot me with their excellent night vision. I made it into the blind successfully and waited for the sun to rise. In the moonlight, I could see that there were only about a hundred cranes near me, but they were close enough to photograph. Instead of being quiet and sleepy as I had expected, they were quite vocal and active. Several small groups flew in and joined the assembly, loudly announcing their arrival. The group seemed eager to start a day of foraging for corn in 70 degree weather. As soon as there was enough light I took a few test shots. I’m glad I did, not just because the scene was beautiful and the slow shutter speed gave a ghostly look to the cranes and water, but because about 30 minutes before sunrise a volley of shotguns nearby spooked the cranes and sent them flying away. I left the blind with frozen feet and fewer photos than I had hoped for, but with lots of good experience for next time. Speaking of frozen things, I was exploring Martins Reach State Wildlife Management Area later that day and found half-dormant bullfrog. Although clearly alive, the frog’s body felt as cold as melting snow. Because he was cold-blooded and couldn’t move, I used the opportunity to take some very close photos of his beautiful, golden eyes. This was a special experience for me because one of my earliest memories in nature is of finding and poking another half-dormant bullfrog as I explored a pond with my dad. We still joke about that memory, never expecting one of us to re-live it. Other signs of spring on this warm weekend included Red-winged Blackbirds establishing territories, several small spiders crawling in the grass, fish swimming in thawed ponds, and dozens of brown lacewings fluttering through the air. This entry was posted in Hubbard Fellowship, Prairie Animals, Prairie Natural History, Prairie Photography and tagged blackbirds, cranes, frog, prairie, spring by Evan Barrientos. Bookmark the permalink. Evan Barrientos is the communications and marketing coordinator of Audubon Rockies. His passion is using photography, videography, and writing to inspire people to explore and care for nature. I disturbed a 4-41/2 inch earth worm while cleaning up under my bird feeders yesterday.